Cover reveal! Meet The Book Of Answers (Ateban Cipher #2)! 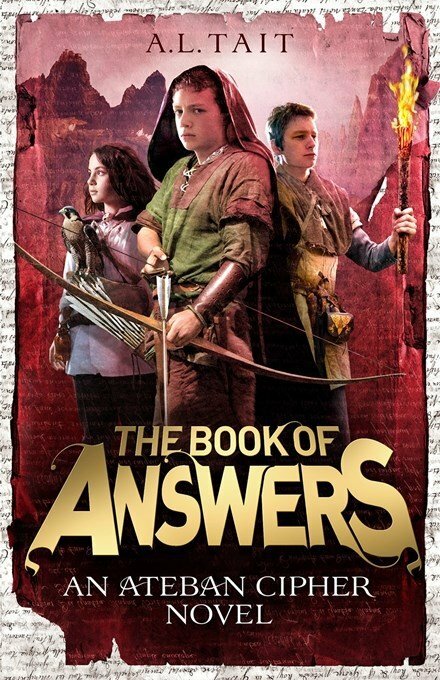 In a very big week for Ateban Cipher news, I’m thrilled to reveal the cover for THE BOOK OF ANSWERS (out in March 2018). “An orphan in exile. A band of rebel girls. And a prince whose throne has been stolen. Come on a journey full of danger, intrigue, adventure and incredible secrets. ‘The Ateban Cipher,’ Lucien continued, ‘is also known as The Book Of Answers.’ He stopped again. ‘Answers to what?’ Eddie asked. ‘When you say “everything”?’ Gwyn prompted. In the gripping second Ateban Cipher novel, Gabe and his companions journey to a remote mountain citadel where they learn the secret of the mysterious, encrypted book that Gabe has been tasked with protecting. But their enemies are close behind them, and new dangers lie ahead. I’m looking forward to seeing it out in the real world! In the meantime, catch up with book #1, THE BOOK OF SECRETS, here.